For most Colleges/ Universities across the country, Spring Break week typically falls somewhere between the last week in February through early April. Students are already planning their trips to popular Spring Break destinations like Panama City, FL, Daytona Beach, FL, and Lake Havasu, AZ. Spring Break is an ideal time and place to get the attention of college students. They don’t have the usual distractions of the semester, and many have spare funds saved up to spend on vacation. Sounds like an easy opportunity for advertisers, but it can actually be quite challenging. One of the biggest problems for advertisers with these Spring Break destination cities is that college kids flock to the beach. With limited amount of ad space on and around the beach, it can be tough to get noticed on-site. That’s why many advertisers use aerial advertising to break through the clutter and get noticed in the sky above. With the right creative and call-to-action your aerial ad could be what all the college students are talking about, Tweeting, Instagramming, and so on. We can help you create a campaign that’s bound to generate buzz. Plus, one of the greatest benefits of banners is that they are portable. You can hit one major Spring Break market one week, and the next big location the next. Think about it! South by Southwest officially kicks off March 13th and it runs through March 22. The eight day conference has exploded since its first festival in 1987. In 2010, it had over 13,000 paying attendees, and these numbers have only continued to grow each year. This massive festival is the highest revenue-producing event for the Austin economy, with an estimated economic impact of $190.3 million in 2012 and $218 million in 2013. This year, SXSW is scheduled to screen 145 feature films, an all-time high for the festival. SXSW presents a different set of problems for advertisers looking to target this vast creative demographic. Instead of there being a lack of advertising space on-site, there are too many opportunities to really get noticed. On average, consumers see over 5,000 advertisements a day, and that is just on a typical day. At SXSW, consumers are in a state of information overload. There are so many interesting things capturing their attention, it can be tough for advertisements to stand out in the crowd. Aerial advertising allows an ad to break free from the competition on the ground below and really make an impact. It is human nature to look up when you hear a plane flying overhead, and your airplane banner is bound to grasp the attention of consumers on the ground below. Think of the sky as your own personal canvas. 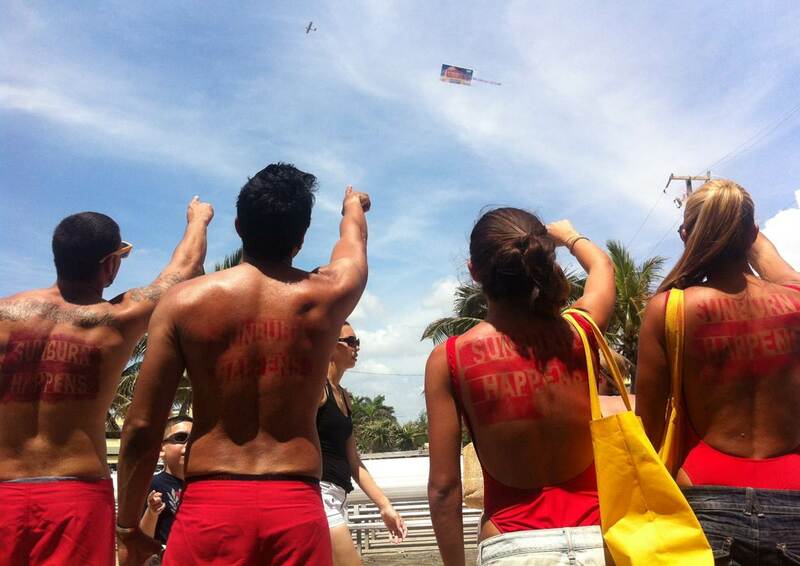 With aerial advertising, you do not have to abide by the festival’s set of rules; you are free to own the sky above. Putting your ad front and center gives your brand sponsorship exposure for a fraction of the price. It’s almost that time of year again. The 2015 men’s basketball tournament kicks off on Selection Sunday, March 15th, and the tournament spans until April 6th. In 2013, attendance at the men’s basketball tournament reached nearly 430,000 fans and the women’s tournament drew 155,212 in the first and second-round games. In 2014, the NCAA Division 1 Men’s Final Four set an all-time attendance record and saw record-breaking online and television viewership for both semifinal games on Saturday, April 5. The two-session Final Four attendance totaled 158,682 fans, setting the record for the highest attendance and surpassing the 2013 Final Four in Atlanta by 9,006 fans. It is no surprise that advertisers pay a hefty price tag for in-venue signage and sponsorship rights at NCAA games. It is a common misconception that advertising at NCAA, NBA, and MLB games is out of reach. We are here to tell you it’s not. If you are looking to target sports fans, both men and women, then NCAA March Madness advertising is right for your brand. Your aerial advertisement can fly for hours above and around the stadium. At many of these events, there are also many outdoor pre and post-game parties, perfect for flying over. We can help you determine the best flight pattern for your brand. We can also help you with your creative. By aligning your brand’s messaging with a certain team, you will be instilling brand allegiance in fans on the ground below. Check out what Dunkin Donuts did for NY Jets fans in the banner depicted above. These are just some of the tactics used when planning an aerial campaign. Let us help you put together a campaign that is fully customized and integrated into your current marketing initiatives. Remember, at Van Wagner Aerial Media, we work with you every step of the way. From designing your creative, to picking your event, to customizing flight patterns – we are your trusted partner – it’s just one small part of The Van Wagner Difference. Ready to get started? Click below for a free quote and one of our aerial coordinators will contact you shortly.